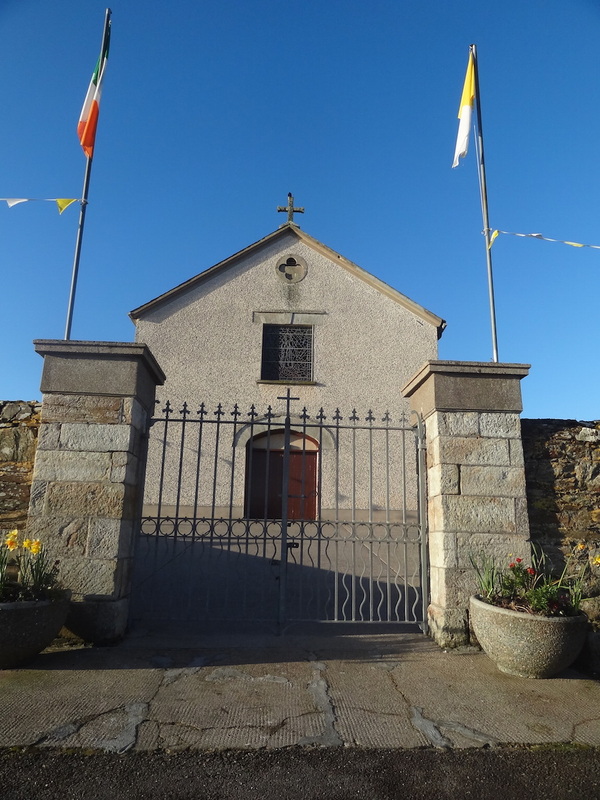 Built around the time of Catholic Emancipation (1825-37), perhaps during the pastorate of Fr. Michael Tobin or of Fr. Patrick McGrath succeeded him in 1836 and served for the next ten years, to be succeeded by Fr. Garret Prendergast in 1847 to 1857. There is anecdotal evidence of the huge effort they both made to help stricken parishioners during the Great Famine. Fr. Prendergast is buried within the church as are his two successors, Fr. Patrick Wall (1857-75) and Fr. John Shanahan (1875-1884). Their headstones were removed from the church floor and placed on the western boundary wall, on the right as you enter the grounds. Fr. John Walsh served from 1884-1901, Fr. John Casey from 1901-1911, Fr. John O’Donnell 1911-14 and Fr. John Lennon 1914. Fr. James Everard was the Parish priest through the revolution, serving from 1914-21 and was succeeded by Fr. Henry Galvin (1921-37), Fr. Michael O’Byrne (1937-51), Fr. William Cahill (1951-68), Fr. John Power (1968-71), Fr. Bill Meehan (1971-78), Fr. Tom Wall (1978-85). Frs. Cahill, Meehan & Wall were buried in the church grounds. During the pastorate of Fr. Meehan the church underwent major renovation and the old high altar was replaced by the present new sanctuary structure in accordance with the guidelines of Vatican 2. The new altar was built by Fr. Aidan, a Cistercian monk from Mt. Melleray Abbey and the external work was carried out by local contractors Larry Looby and Donal Lenane. Fr. Donal O’Connor, now PE in Dungarvan, served from 1985-2001 to be succeeded on his retiral by the present incumbent, Fr. Milo Guiry.